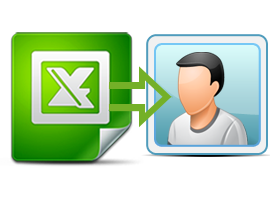 Order Online Excel to Windows Contacts Converter to convert entire contact deatils including First Name, Last Name, Nickname, Company, Title, Email id, Phone numbers etc into Windows Contacts . Click here to know how Excel to Windows Contacts Converter work. Click here to Download Excel to Windows Contacts Converter. Click here to read more about Excel to Windows Contacts Converter.